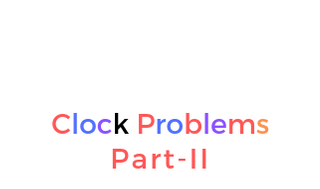 Clock Problems with solution and answer for Railway Group-C ASM, TC, NTPC, Technician, Junior clerk, Group-D, Bank PO. Clock coincide problems with solution and trick. Clock angles problems with solution and trick. Q1.How many times in day hands of a clock coincides? Trick In every hour both the minute hand and hour hand coincides ( i.e. they become straight in the same direction ) once (except 12hrs to 1hrs). So during the 12 hours, they coincide 11 times because during 12hrs to 1hrs they never coincide. In a complete day, there are 24 hours. Hence they will coincide total 22 times. Q2.How many times in a day the hands of a clock becomes straight? Trick In every hour both the minute hand and hour hand become straight 2times ( in same direction one time and in opposite direction one time except 12hrs to 1hr and 6hrs to 7hrs ). Since 2 times every hour. So in a day, they become straight only 44times in 22hrs. Q3.How many times in a day are the hands of a clock become straight but in opposite direction? Trick In every hour both the minute hand and hour hand become straight in opposite direction 1 time (except 6hrs to 7hrs). So during the 12 hours, they become straight in opposite direction 11 times since during 6hrs to 7hrs they never become straight. In a complete day, there are 24 hours. Hence they will become straight in opposite direction total 22 times. That is after 3hrs and both the minute hand and hour hand will coincide. Q4. At what time between 9 and 10 O' Clock will the minute hand and hour hand of a clock be together? Trick: Because here the total space gap from 12 hrs to 9 hrs in minute is 45 min. So M=45, Then we put M=45 in the formula and get the result. Q5. At what time between 7 and 8 O' Clock will the hands of a clock be in the same straight line but not together? Here total space gap will be from 12 to 1 not from 12 to 7 bcz both the hands are in straight line but not in together i.e. they will straight in opposite direction, not in the same direction. So opposite of 7 is 1. Hence we must count 12 to 1 space gap in minute. So here M=5 min. Now put the value of M=5 in the formula. That is at both the hands of the clock become straight but not in together. Q6. At what time between 4 and 5 O'Clock hands ( Hands means both minute hand and hour hand ) of a clock become straight in opposite direction? Trick: Here total space gap will be from 12 to 10 not from 12 to 4 bcz both the hands of the clock become straight in opposite direction, not in the same direction. So opposite of 4 is 10. Hence we must count 12 to 10 space gap in minute. So here M=50 min. Now put the value of M=50 in the formula. That is at both the hands of the clock become straight in opposite direction. Q7. At what time between 6 and 7 o'clock both the hands of a clock will be 90° or right angle in the first time? Trick: There is two (2) formula to find out the time. Q8.At what time between 6 and 7 o'clock both the hands of a clock will be 90° in the second time? Q9. After how many minutes past 7, the hands of a clock form 90 degree angle for the 1st time? Trick: Here you must count gap space in minute from 12 hrs to 4 hrs because whenever minute hand reaches 4, the angle between the minute and hour hand will form approximately 90 degrees. So, M=20 (gap in minute from 12hrs to 4hrs ). Now put the value of M in 1st formula and get the result. Q10.After how many minutes past 7, the hands of a clock form 90 degree angle for the 2nd time? Q11. How many times in a day the hands of a clock becomes 90° / right angle? Q12.A clock gains 5 sec in every 3 minutes and was set right at 8 AM. What time will show at actual 10PM on the same day? Here clock ran exactly 8AM to 10PM, that is total 14 hrs. = 23 min 20 sec. Since in 14 hrs faulty clock gain 23 min 20sec. So, at original 10 PM, the faulty clock shows 23 min 20 sec more time than original time. That is, the faulty clock will show 10: 23:20 PM. Q13. A clock loses 5 sec in every 3 minutes and was set right at 8 AM. What time will show at actual 10 PM on the same day? 09pm: 36 min: 40 sec. Q14.A watch gain 10 min every hour and was set right at 8 AM. What was actual time when it showing 10 PM on the same day? Trick: Here, total time from 8AM to 10 PM is 14hrs. The wrong watch starts exactly at 8 PM and lastly, it shows 10 PM. That is wrong moved total 14 hrs. Since every hour the wrong watch gain 10 min, we can reversely say that when the wrong watch moves 1hr + 10min=(1+10/60) hrs=(1+1/6)hrs=7/6 hrs, right watch moves 1hrs. Now it is seen that whenever the wrong watch moves 10hrs, right watch moves 2 hrs less than the wrong watch. So, we must go back 2hrs from 10PM and get the actual time. So actual time will be 10-2=8 PM=8:00PM. Q15.A watch loses 5 min in every 1 hour and was set right at 5 AM. What was actual time when it was showing 6PM of the next day. That is, right watch moves more than the wrong watch. So, the actual time was 6PM+ = . Q16. A watch which gains uniformly is 2 minutes slow at noon Monday and is 4min 48sec fast at 2PM on the following Monday. When was it correct? ▭: 1. In mirror image, figure change left to right but top to bottom remains same. 2. If given time is between 1 O'clock to 11 O, clock, then we must subtract given time from 12:00hrs =11:60hrs. 3. If given time is between 11 O'clock to 1O, clock, then we must subtract given time from 24:00hrs =23:60hrs. 4. Letter in mirror image remain same are- A,I,H,M,O,T,U,V,W,X,Y. Q17. What time will show by mirror if the real-time shows by the clock are 9: 27? Tk: Since the given time is9:27 which is between 1 to 11 so we subtract it from 11:60 and get the result. Q18.If time appears in the mirror 11:09 then what time will appear in the clock? Tk: Since the given time is11:09 which is between 11 to 1 so we subtract it from 23:60 and get the result. Q19. Time shows in the mirror are 6:00, then what will be the real image in the clock? Tk: Since the given time is 6:00 which is between 1 to 11 so we subtract it from 11:60 and get the result. Tk: Since the given time is 3:43 which is between 1 to 11 so we subtract it from 11:60 and get the result. Q21 If the time in the clock is 12:37. What is the time in the mirror? Tk: Since the given time is 12:23 which is between 11 to 1 so we subtract it from 23:60 and get the result. ▭: 1. In water image, figure change from top to bottom but left to right remains same. 2. If in the given time hour H≤5 then resultant hour value will be 5-H, If H> 5 then resultant hour value will be 17-H.
3. If in the given time Minute M≤30 then the resultant minute value will be 30-M, If M>30 then the resultant minute value will be 90-M.
4. Letter in the water image remain same are B,C,D,E,K,O,X,I,H . Q22. By looking in water it appears that it is 3:10 in the clock. What is the real time in the clock? Tk: Since the given time is 3: 10, here H=3<5 and M=10<30 so we subtract it from 5:30 and get the result. Q23. By looking in water it appears that it is 9:40 in the clock. What is the real time in the clock? Tk: Since the given time is 9: 40, here H=9>5 and M=40>30 so we subtract it from 17:90 and get the result. Q24. By looking in water it appears that it is 3:13 in the clock. What is the real time in the clock? Tk: Since the given time is 3: 13, here H=3<5 and M=13<30 so we subtract it from 5:30 and get the result. Q25. By looking in water it appears that it is 4:42 in the clock. What is the real time in the clock? Tk: Since the given time is 4: 42, here H=4<5 and M=42>30 so we subtract it from 5:90 and get the result. Q26.Time appears in water is 5:47, what will be the correct time in the clock? Tk: Since the given time is 5: 47, here H=5 and M=47>30 so we subtract it from 05:90 and get the result. Q27. After how many minutes past 7, the hands of a clock form 45 degree angle for the 1st time? Q1. At what time between 7:00 to 8:00 are the hands of a clock at angle 45 degrees for the second time? Q2.What angle is made by minute hand in 29 sec? Q3.What angle is made by minute hand in 59sec? Q4.A clock which moves continuously fast, it lags 10 minutes on Sunday 7am, it is ahead 5min on Tuesday 7am. When was the clock correct? Q5.What is the angle between the hands of a clock at 3:56?